Let’s Review a Product with…SCIENCE! Stormageddon 2016 turned out to be much easier on us in Tacoma and Lakewood than predicted. Nationally, forecasters predicted our area would be hit by the storm of the century with wind gusts exceeding 70 mph. Indeed, some coastal areas were hit pretty hard. There was even a tornado down in Oregon. Whoa! That’s just weird. But here in the South Sound area, we were really surprised and pleased when we clocked our top wind speed at 38 mph, which barely makes Galapagos wake up from her slumber in the slip. Whew! What a relief! A tree in Tacoma waits for the wind. So this time, the science/art that is weather forecasting just plain old got it wrong for our area. If you are interested in why, here’s a local article that explains how mother nature always has a few tricks up her sleeve. Scattered around the world, groups of professional, knowledgeable weather forecasters couldn’t believe it, as they examined the radar images and worried that people wouldn’t believe them next time a big storm was coming. Tell you what: I will believe them and I hope you will, too. I’d rather be over prepared than caught by surprise. It just goes to show how difficult it is to predict the great mother’s wrath. It’s good to put that into perspective before one heads out to sea. Think about it. These are experts. The rest of us are not. If they get it wrong, we certainly can, too. Just saying. I think we’ll just stay on the safe side by giving possible storms a wide berth as much as possible. Since I have faith in science, I thought I would engage in a little experiment on board Galapagos, just for fun and because I am easily amused. Recently Practical Sailor magazine had an article comparing brands of toilet paper in terms of their ‘dissolvability’ and, thus, how hard they are on a boat’s holding tank system and how likely they are to cause a pollution problem if pumped overboard. They did a test with several different brands, both regular brands and ‘marine’ brands and reported on how fast they dissolved in water. I thought it was a pretty interesting test. It got me thinking. What was all our toilet paper doing in our holding tank? Was it decomposing? Was it sitting there in a large mountain of yuck? How could I find out without getting into a disgusting project? Literally. And what difference does that make, anyhow? Well, I’ll tell you, because if you don’t live on a boat, you’ve probably not given this much thought. The United States has laws about pumping your sewage overboard, and we follow those laws. But other countries do not have the pumpout facilities that we have here. In some places, people just pump their sewage overboard right there in the same bay you are anchored in. Kind of gross, but there it is. Because I’ve been raised here in our country where we have things like waste water treatment and where I am educated enough to care about the environment, I’d kind of like to be able to discharge our sewage in the highest and best way possible, given the fact that I’m not going to spring for a big waste water treatment facility on our boat. If I’m snorkeling somewhere, it’s really going to gross me out to see large clumps of human waste and toilet paper floating by. So I don’t want to submit others to that, either. Galapagos has a macerator pump that grinds everything up before discharging, but what if we could use science to make the discharge that much less ‘papery’ in the first place? And also what if we could break solids down before dumping them overboard, even at sea? That would be a win for everyone. When I refurbish ours it will look like this. I like to think of this as industrial art. Some people solve the toilet paper problem by never putting toilet paper down their marine heads. That works pretty well in the United States, and especially in the marina where you can take your trash out regularly. But we won’t be able to take our trash out regularly when we are cruising. Plus, we have those lovely heads that rarely get clogged. We have the Crittendon Marine Skipper II heads. Those who have them love them. We’ve literally had people tell us how envious they are of our toilets. (That’s right. That’s what happens when you live on a boat. People look at what kind of toilet you have.) With these babies, we don’t really worry about clogs too much. We don’t mind throwing our tp out with the trash here in the marina, but I’m kind of loathe to keep bags of used tp somewhere in my boat for weeks at a time. Call me a princess. So we don’t worry about clogs, but we do worry about solids building up in our holding tank and then sitting there forever rather than getting pumped out. Those solids are usually in the form of un-decomposed toilet paper. And that’s the long story about why this Practical Sailor article caught my eye. Unfortunately, they did not test our brand of toilet paper: Kirkland from Costco. We have also been using Zaal Noflex Digestor in our tank and I wanted to know if that actually worked to help break down the paper. So I set up a small laboratory in the galley down at Galapagos and commenced to testing. Science! The goal: to determine how long it would take for plain toilet paper to decompose in plain water, plain water plus Noflex Digestor, and salt water plus Noflex Disgestor. I did not test using plain salt water because I forgot. Maybe another time when I’m bored. From the left, salt water/digestor, fresh water/digestor, fresh water alone. Intact piece of toilet paper after 9 hours in plain water. 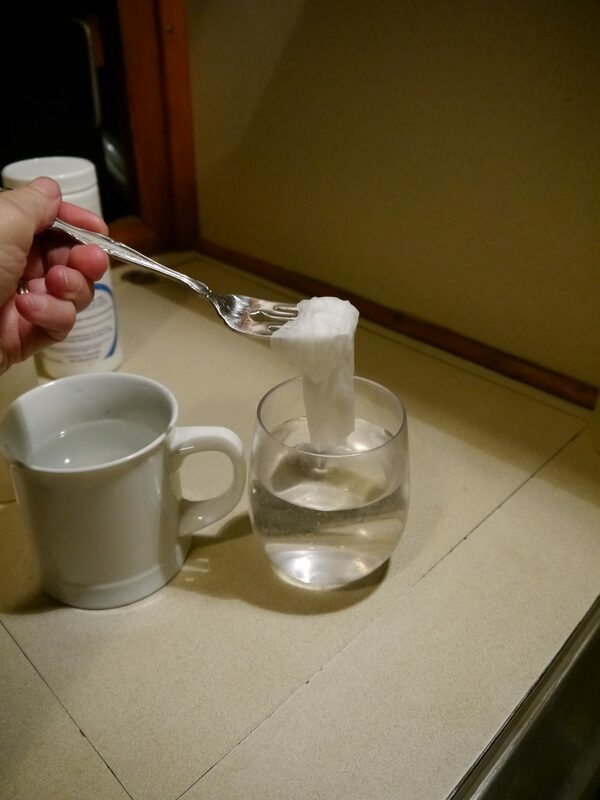 Plain water with a pinch of the digestor. Significantly deteriorated after 9 hours. Plain water alone after 24 hours. 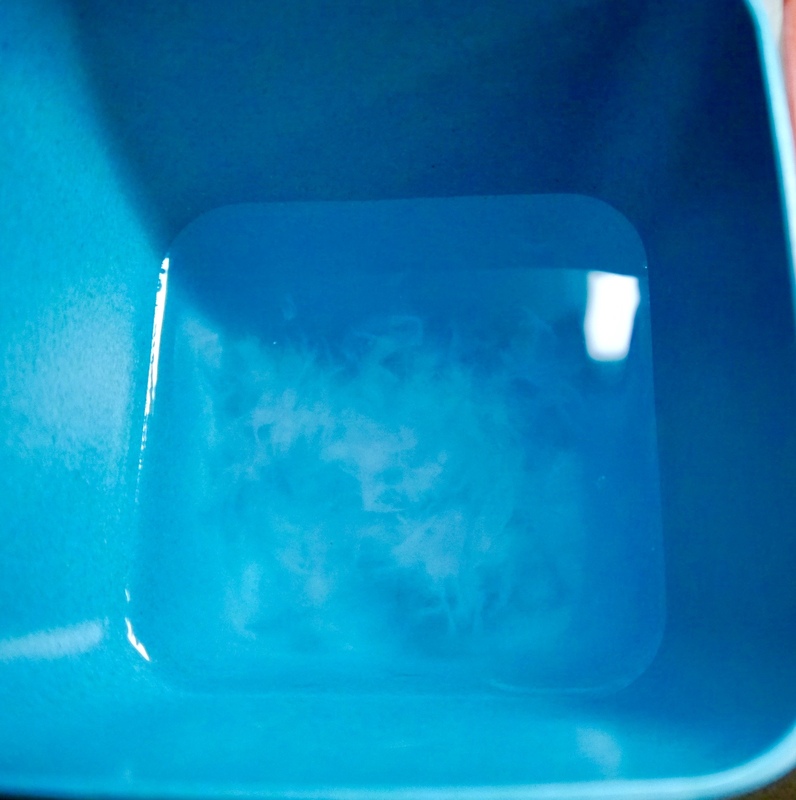 Plain water with digestor after 24 hours. Closeup of the salt water with digestor.after 24 hours. I’ll report back on how that part of the experiment goes, but the results of this test were already very clear. While we are at the dock, we can use a fresh water flush and add the Zaal Noflex Digestor regularly and we’re going to be fine when it comes to pumping out. The directions on the container say to add a bit every day or so, more or less, depending on whether you have buildup in your tank already. This stuff works, and we can keep buying our usual brand of toilet paper and skip the expensive marine stuff. When we are traveling we can continue to use the Zaal, and we will go to a salt water flush to save our fresh water. I’m betting the constant motion of the boat will keep things agitated enough to encourage decomposition. I’ll be putting in a good supply of Zaal Noflex Disgestor before we go. One caveat is that we use plenty of water to flush, and we make sure to clear the pipe every time. The extra liquid is going to help the digestor get to everything in the tank, even if we have to pump out a little more often. It’s worth it. Oh, and by the way, there is no ‘head’ smell when we use this. Nada. None. That, alone, makes this product a ‘win’. This entry was posted in Boat Living, Product Reviews by Melissa. Bookmark the permalink. That build up you are referring to is why we started using the NoFlex Digestor. It is designed for commercial vessels originally, but is available now to the individual market. When we bought Galapagos we noticed that the holding tank never seemed to get ’empty’ and shining a light against the tank showed that one corner, to port, the side to which we list a bit, had what looked like buildup in the corner and up the side. This stuff is supposed to take care of that. Now, in terms of an experiment aboard Galapagos involving solid waste, I would have to get someone to make a ‘donation’ to that cause. Hey, maybe my dog? Not sure I could stomach that, but sometimes, in the name of science, things have to be done. We will see. Elsie and I have been using Zaal for about three years now, since we put in a vacuum system. We also use Sudbury lubrication and deodorant, and use septic tank grade toilet paper. When we pump out we flush the tank through the toilet and vacuum generator until it shows clear in the plastic pipe on the shore side pump out system. When we do have to use the overboard system In BC or AK, we do the above flush then fill the tank with fresh water then go in open water and empty the tank. So far, with pretty extensive use of the system, we have had not clogs, and the twice that we have removed the level sensor has shown minimal build up. A healthy dose of white vinegar can fix this. That’s great feedback. I haven’t found the need for a deodorant yet when using the Zaal, but I will look into that lubricant. We have a pumpout boat that comes to the slip in the marina, so we cannot control how well they do their job. But we do fill the tank with fresh water before the pumpout, just to be sure there is plenty of liquid to enable ‘flushing’ action. Re “toilets that never clog” : Hah! Until the day it does. We crewed offshore a few years ago, and the skipper assured us his fancy smancy marine heads NEVER clog, so don’t worry. Less than 24 hrs after starting the trip, toilet number 1 clogged. Thankfully, the boat had 2 heads. Skipper had to disassemble toilet 1 at sea: culprit was a clogged toilet. (“Not our doing” we said, “we never put toilet paper in ANY marine head!” ) A couple days later, head #2 broke, permanently (luckily, #1 was back in service, with noone putting tp down it). Never say never, no matter what brand of marine head. It’s always just a matter of time. We use a basket under the head sink for used tp, just as they do in Mexico (and Asia). OOOH, I didn’t say never! Because that would be tantamount to throwing down a gauntlet in front of the toilet gods. I said they ‘rarely’ clog. And that is true. I’ll stick with ‘rarely’ and treat them gently! The boat we had before this one had a Lectra San aboard and we loved it — no holding tank, no fuss. Those were the good old days! Looking at narrowboats, we’re trying to decide what kind of set up we want. So many of them only have cassette toilets and I’m not going there! Not that I’d be in charge of removal, but what a hassle! Do they not have a dessicating (composting) type toilet available? Seems like Europe would be ahead of the curve there. You’ve done a great service to the world with this science experiment. I would fully expect the team in Stockholm to be seriously considering your for next year’s Nobel science prize 🙂 I’m one of those folks who doesn’t like to put toilet paper down the toilet. But if I ever decide to do so, now I know I’ve got your excellent research to help me in the decision making process. I am surprised at how this issue of toilet paper is right up there with anchors and other religious belief systems! For now, we do the ‘throw it out on land’ approach, but I’m totally not going to be stowing bags of used TP on the passages. This stuff will take care of it! A longtime liveaboard (who knows his stuff) down the dock recommended “Happy Camper” in lieu of Zaal, saying it was just as effective at a much lower price. I tried it and seems qualitatively as good. If you do any follow-up studies, you might want to try it out. I am considering some very interesting follow up studies, indeed. I’m kind of bored lately. That, plus the ‘easily amused’ part of my brain, has all kinds of interesting experiments being created. We shall see! Yes when i first started i remember hauling buckets of waste off of ships taking it back to the lab and my back yard (upwind) doing tests adjusting the formulation all sorts of fun smelly stuff. Then hours in the field watching how it worked in the holding tanks and with the treatment systems on the ships. Testing it at pig farms (the worst) and with home septic. Noflex does work with cassette toilets . Hi Dave! Thanks for commenting! You’ll be glad to know that I’ve done further research on your NoFlex and will be writing another follow up post. That stuff is the best! And you won’t be disappointed! We’re still using it here in Mexico, and it’s still working great. Super that you like the product and you are happy with the performance. Hey that’s great! I look forward to your new product. Please be sure to let us know when that is released so we can give it a try and report back to our readers. Of course, we are in Mexico right now, but we’ll be back in the states for awhile this summer/fall so maybe it will be available by then. What product should i invent next ? Excellent! We’ll get some when we are home this summer. Next you might want to invent an ‘extra strength’ Zaal formula that is meant to work with sea water. We’ve had to use more of the Zaal as temperatures have increased here in Mexico. Finally we just stopped flushing with sea water altogether, which means we are using our precious fresh water to keep the head smelling, or NOT smelling as it were. Maybe a formula that is intended primarily for sea water in warm weather? Is it the sea water stinking in the bowl between flushes ? You also get a kill off of the plankton with little light and no aeration from waves (this will also generates smells) . If so put just a small pinch of Noflex in the bowl water after you flush with sea water. You can use your fingers just rinse your hands after. You know it’s possible. We do use Zaal in the bowl after wards, and have even flushed with sea water, rinsed with fresh water, then added Zaal to that. Eventually we just went to an all fresh water flush. That has the added benefit of keeping sand out of the system, a problem we had not anticipated. This warning was included in the product info on Fisheries Supply: “Do not combine with other sanitation system treatments or chemicals” How do I start using Noflex if my system has chemicals in it? Super-duper pump out with several doses of water? Well that’s what I would suggest, and it’s what we did. But if you scroll down the comments section here and see Dave Stranks, he’s the creator of the product and I bet he can advise you. The warning is more for people that might mix two different cleaners together outside of the tank . Wondering if I should use a larger quantity the first time to get the process jump started? Also, the product info states the exterior of the sanitation hoses can be cleaned with Noflex to help eliminate odor. What are instructions for that? Thanx. Your right—what size of a tank have you ? In a spray bottle add a 1/4 oz of noflex and then fill 3/4 (24 oz) full with fresh water Shake till dissolved (it takes a lot of shaking ) then spray on hoses and surrounding areas you might have a problem with. We have 2 40 gallon tanks. Thanx for directions. We are believers! Started the Noflex about 2 weeks ago. Nasty head odors are gone. We are now using it every 2 days. I am going to attack the hoses tomorrow. Mind you, this is a 24 year old new to us boat so the “old boat smell” was noticeable. Now it’s about 90% gone. BTW, we purchased the head cleaner also. If you need a distributor in the Great Lakes, contact me. I’ve been using Noflex for years. Never a smell from the holding tank. I am pretty generous with it. I dump a few ounces per use. Yes we use it a bit more sparingly but it definitely helps with odie and keeping the tank sludge free. We recently switched back to using seawater to flush and have not had any issues with odor. Yet. We have many marine stores on the Canadian side on the great lakes that supply the Noflex and toilet bowl cleaner. Western Marine & Transat Marine distribute it across Canada for us. The Eastern USA I have no distribution.